The woman in New York City's Upper East Side shouted to me as I approached. At first I wasn't sure if she was speaking to me at all, but she waved her cigarette and smiled as I passed close to her on the sidewalk. It was only a random compliment from a total stranger, yet more than a year later I think of that beautiful, brown-skinned woman whenever I wear the black jumpsuit. She could have silently admired my fashion choices, but she chose to remark on it to my face. Because of her casual brand of kindness, a powerful aura of confidence surrounds that jumpsuit to this day. There's something to this, I think: although negative words stick around our hearts, kind words stay even longer. What if women encouraged other women? Consciously or not, comparing our own beauty, intelligence, talent, skill, or spiritual growth with other women's is a thing that most, if not all, women battle daily. I think we fail to realize that our words have power with each other. I constantly see the women around me doing admirable things. I see beauty and character and humor in these girls, yet how often do I take the next step and speak it out? I know how much a kind word can lift my spirits, especially in places in which I might feel insecure, or "too much." The cool thing about women praising other women is how the effect ripples - when women are filled and uplifted, they fill and uplift. We understand each other better than anyone else possibly could. It is for us to champion our sisters! We have it in our power to speak into existence things that aren't even formed yet within other hearts. Let's use our words to create, not destruct! What if women encouraged men? A thing the modern feminism movement gets wrong is the focus on "women are better than men, as all men are pigs." Women are not better than men - we are equally brilliant, purpose-filled, God-created beings with full as much heart and spirit as men. Which is, logically, to say that men have full as much heart and spirit as we have, being created in the same way. And as much as they seem to be self-sufficient and independent, sparing with words and not in need of compliments, the men in our lives need encouragement. Do you know a guy who stands out from the crowd in the way he treats the people around him? Speak it out. Is your cousin working three jobs to provide for his wife and infant daughter while he finishes college? Cheer him on. Is your boss working grueling hours? Your neighbor breaking hard habits? Find these men and gift them some verbal applause: "I see you. I know how hard you're working. I appreciate the things you're giving up to be a real man. Keep it up." I swear to you, speaking the admirable things you see over people nourishes as deeply as a home-cooked meal. It's something I want to become better at, and so my focus recently has been "random acts of encouragement." Truthfully, this became a theme in my life in the last several weeks because I've needed to be encouraged. Having received the kindness of my friends, family, and even strangers, I've started to notice the places I can pass it on. Those people who could use a compliment, a surprise coffee, help with their work, or simply a "Hi, I'm thinking of you text." Those people who are sleep-deprived, or sick, or sad. We live in a world where the focus is on us and how we feel. I'm not sure about you, but I'm so ready to turn the focus outward, and do my level best to lift others higher. We can all use a hand up, and it's so easily in our power to offer that through something as small as a kind word, or a small gift. It's in that spirit that I'm sharing a recipe I came across through Zoe Bakes (who came across it through Displaced Housewife) for peanut butter cup meringue cookies! I made these this morning to bring to the girls I used to nanny for. They are also the perfect treat for a mama in your life who is off dairy for the sake of her colicky baby, or a gluten-sensitive college student who is studying hard for finals! 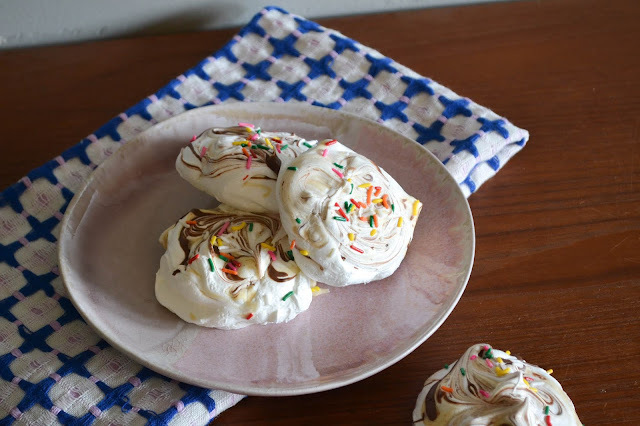 I'm always on the lookout for desserts that are dietary-restriction-friendly without sacrificing taste, and these cloud-light cookies are just that: peanut butter and dark chocolate swirled throughout a cookie that is crispy on the outside and marshmallow-soft on the interior. 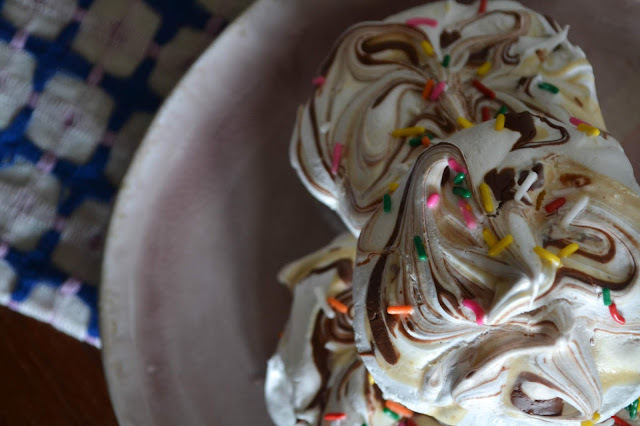 I added sprinkles since we're celebrating one of the nanny girl's ninth birthday, but you can feel perfectly free to leave them off or use Maldon salt instead for that grown-up sprinkle effect! Regardless of your topping choices, I challenge you to make a batch of these meringues, or another treat, and gift them to someone you know who could use that tangible reminder that they're loved and cherished. It's amazing what a little encouragement can do. recipe from Zoe Bakes, as shared by Rebecca Firth (Displaced Housewife) from her book The Cookie Book! Make the peanut butter glaze by whisking together powdered sugar, peanut butter, and heavy cream till smooth. 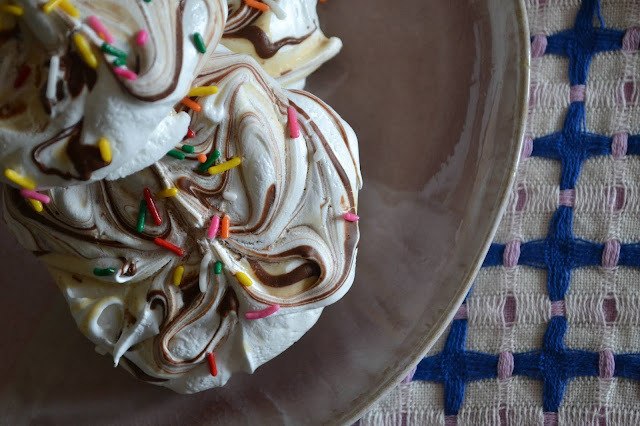 Add more cream until it is of a drizzling consistency. Whip egg whites, cream of tartar, and salt until nice and foamy. With mixer running on medium speed, shake in granulated sugar. Beat until medium-stiff peaks. Add powdered sugar and beat until very stiff, glossy peaks. 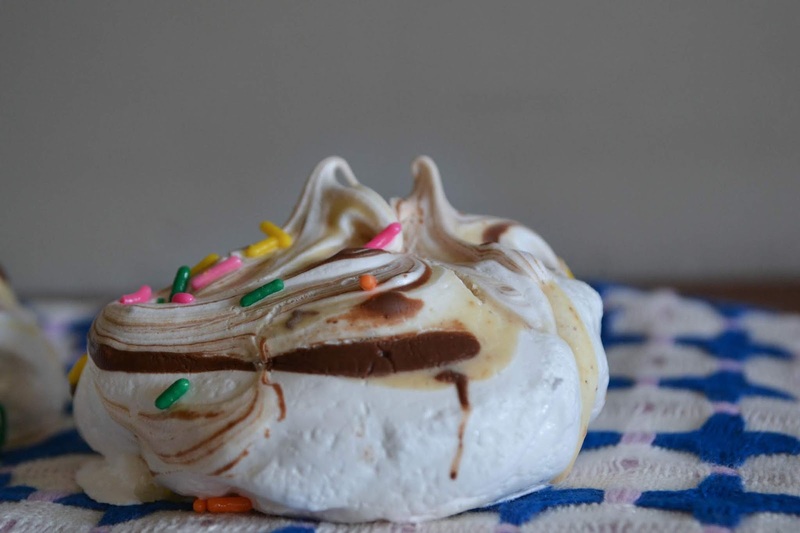 Drop by large spoonful (or use a dough scoop) onto parchment-lined baking sheets - you should be able to get twelve meringues out of the batch. Drizzle peanut butter and dark chocolate over the meringues, careful not to overload the meringues, as the topping will become too heavy and cause them to fall. 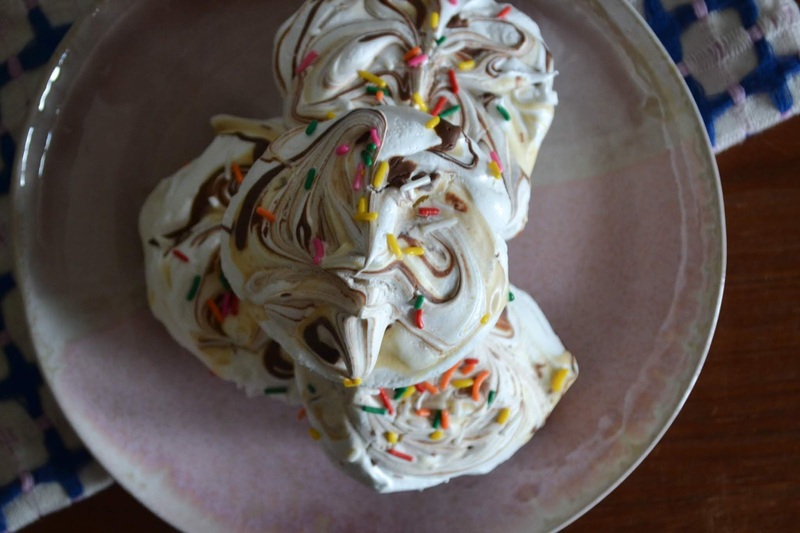 Take a toothpick, knife, or skewer and swirl peanut butter and chocolate through the meringue. Bake for two hours in the oven, then turn off the oven allow cookies to cool inside for a couple more hours. Enjoy immediately or store for 2-3 days in an airtight container.